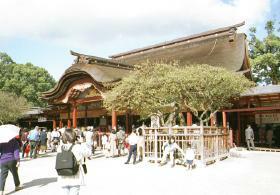 A shrine was built by imperial command in 919. 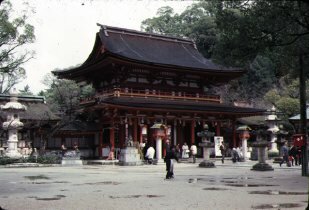 The presint main shrine building dates from 1591. Today,7 millions of students and parents from all over Japan visit the shrine to pray for success in academic exams. If the east wind blows Send your fragrance to me, O plum blossoms-- Even though you have no master, Do not forget the spring! According to legend, moreover, the plum tree returned his affection: soon after its master reached his place of exile, the tree flew through the air after him to the Dazaifu. 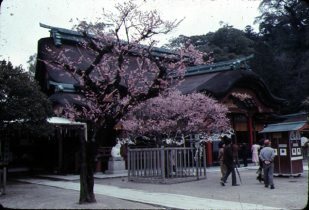 The great plum tree that stands before the shrine today is identified on a signboard as the Tobi-ume, or "Flying Plum," and is said to be the direct descendant of the original tree. It is said also to be the first to blossom of the many thousands of plum trees surrounding the Temman-gu, the shrine that honours Michizane's memory. A plum tree at the right front side of the main building is called "Tobiume," which means "flying plum tree."